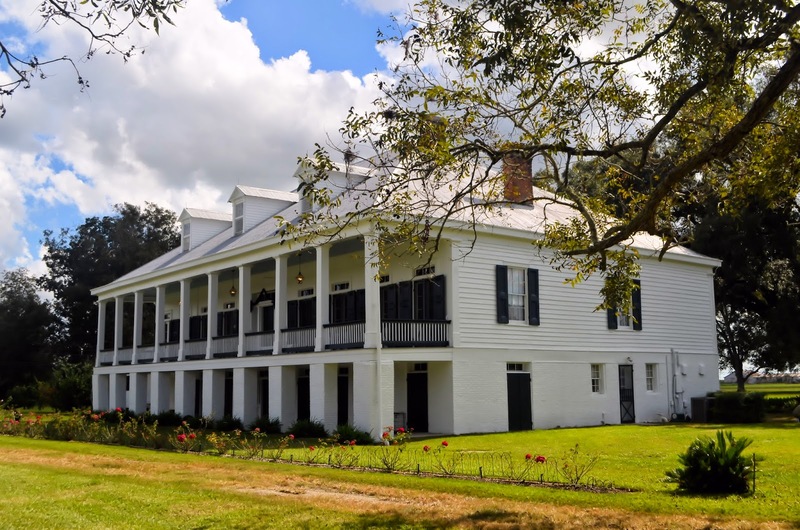 Take a drive along Louisiana's Highway 18, a winding stretch of road that matches the meandering path and measured pace of the Mississippi river, just west of a thin sliver of a town called Vacherie, and you'll soon find the elegant, Creole style St. Joseph Plantation. 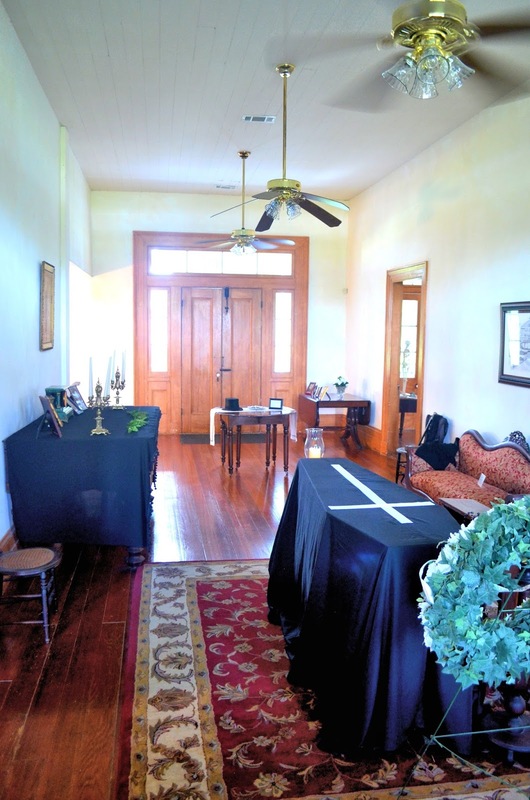 If you do so in October you will be able to tour a home that is in the midst of observing the traditional mourning customs of the Creoles. St. Joseph is a working sugarcane plantation, surrounded by fields of tall, green cane and an industry that supplies over 32,000 jobs to Louisiana. While sugarcane is grown all across the lower half of the state, it is here, along the banks of this great river, that sugar first became a prominent aspect of New Orleans society. And it was here that Valcour Aimé, known as the "Louis XIV of Louisiana", built his sugar empire, which included St. Joseph, a home he bought for his daughter Josephine in 1858. Restoration of the plantation began in 2002 by descendants of several families that once owned St. Joseph. We were pleased to learn that our tour guide for the day would be Diane Butler, a great, great, great granddaughter of Joseph Waguespack, who bought the plantation in 1877. Diane was more than just a tour guide. We did not feel as if we were touring a historical museum. Instead, we felt as if Diane had invited us into her home, spinning tales of her families history as she opened up each room to us. What really set this tour apart from so many other plantation tours was the way in which Diane wove the stories of those who lived at St. Joseph into those of the families all along this stretch of the Mississippi. 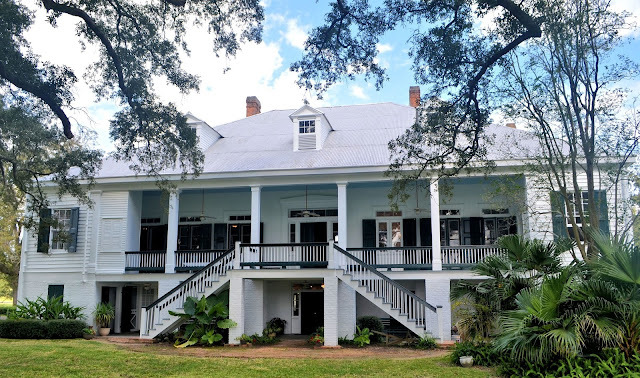 In fact, one quickly came to understand that St. Joseph, like Oak Alley Plantation, Felicity Plantation, Laura Plantation and others in the area, were all a part of a tight-knit community; a neighborhood made up of families that grew up together, intermarried, and whose successes and failures were indelibly tied together. As proof of this, Diane told us of her grandparents. Her grandmother grew up at St. Joseph, her grandfather at Oak Alley, and their courtship began as they promenaded along the levy. 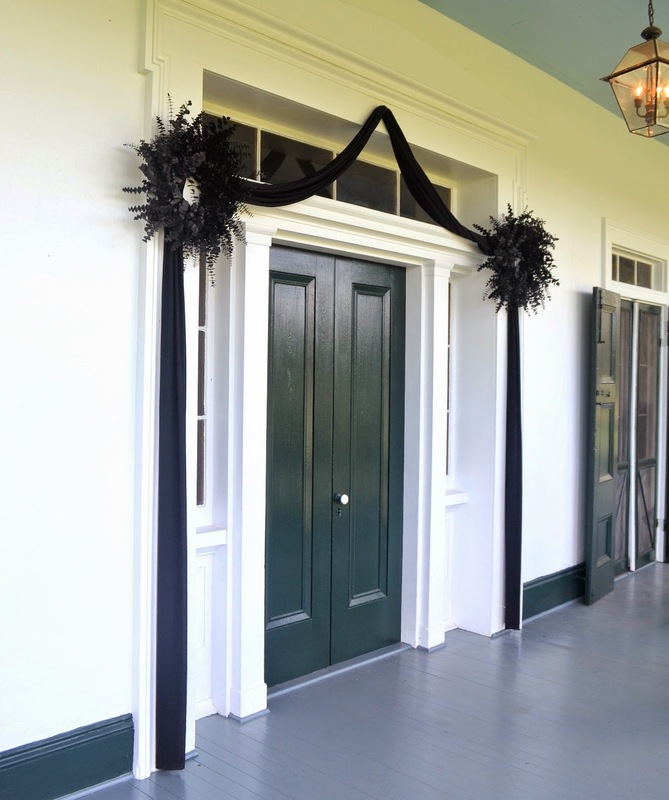 Front door draped with black crape and wreaths to indicate a death in the home. 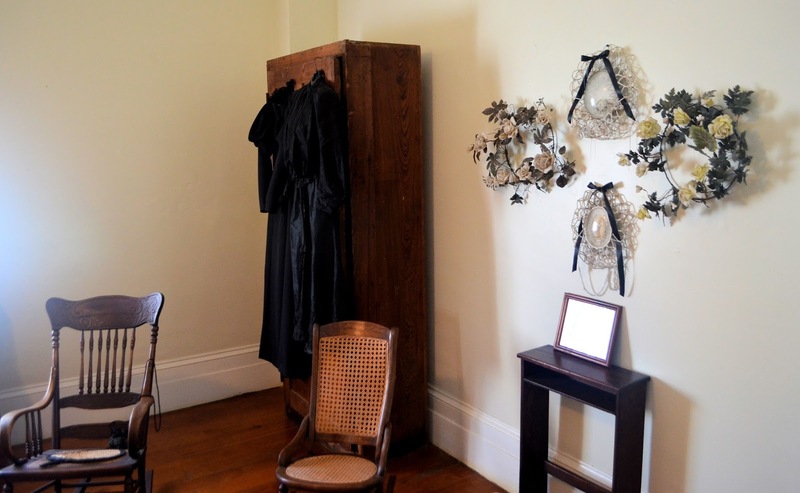 During the month of October, St. Joseph Plantation observes the mourning customs of the early Creoles. From the road one can first see the front door with crape and wreaths. This was a way for the family to announce to outsiders that a death had occurred. In this way concerned friends and relatives did not have to stop and inquire if a sick member of the family was still alive. They could wait until they saw the draping of the entrance after which they would know the family member had passed. 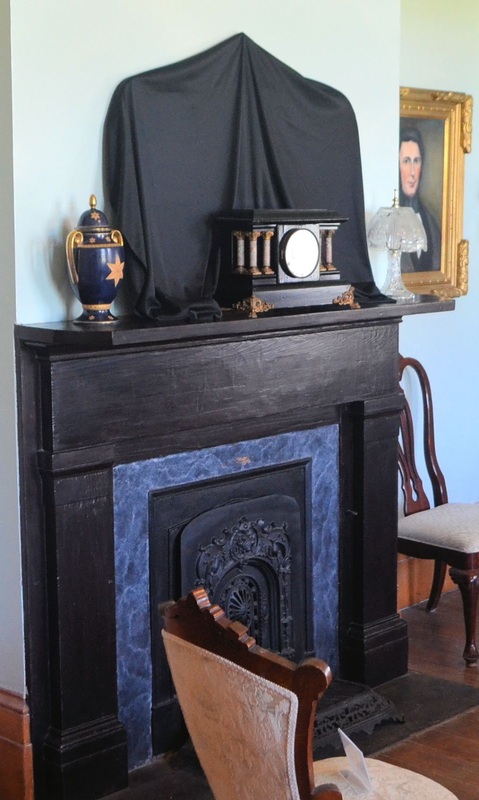 The body was prepared and placed in a coffin for viewing in the parlor. Sometimes a bedroom was used. As the families at St. Joseph were Catholic, a prie-Dieu was placed beside the coffin so that visitors could pay their respects and pray for the deceased. The coffin lies in the parlor, ready for visitors. Because embalming was not common until after the Civil War, efforts had to be made to control the odor of death. Sometimes, a bucket of ice was placed under the coffin to keep the corpse cool. Candles were lit at both ends while fragrant flowers and greenery were placed about the room. This was important, since a vigil was kept for two days in which the body was never left alone. As we followed along with the tour, I wondered about this now abandoned custom. We are so isolated from the dead these days. Unless you request to be involved, as my wife did when she applied the makeup for her mother before the viewing, you probably won't have much interaction with the body of your deceased loved one. Are we missing something when we don't have them in the house for two days? When one could sit with the body for hours, reflecting on their lives, the impact they made, or maybe needing that chance to say a few words you couldn't before? Perhaps it is something we need to bring back. I feel certain it won't ever be. Certainly not any time soon. With mirrors covered and clocks stopped at the time of death, a household in mourning seemed to hold its breath. In a way, time did actually stop as the community gathered to console the family and the deceased was prepared and sent off into the afterlife. Again, there seemed to be more attention paid to this event, more focus on the man or woman or child who was passing on. Today we drop by to a viewing after work, and if we can we attend the burial, a short occasion managed by strangers whose business it is to get the body propped up for a quick look and an even quicker eulogy. Friends and family might stand around for finger foods for a short time. But in the end we all have to rush back to living. Death is not a subject over which we like to linger. In one of the rooms at St. Joseph we were shown a collection of wreaths known as immortelles. These decorative wreaths were often taken to the cemetery during the burial, and might be either left there or brought back to house as a symbol of remembrance. They often included the use of glass bead and photographs under glass. The immortelles hanging at St. Joseph were found in the attic. and her husband Alexis Ferry. Of course, much effort went into dressing for this time of mourning. And for a widow, there were a great deal of rules and customs to follow. They would wear dull black mourning clothes for the six months during the first stage of mourning, sometimes referred to as deep mourning. There might be a second stage, half-mourning, in which a few muted colors such as heliotrope (a reddish, blue-red) might be worn. 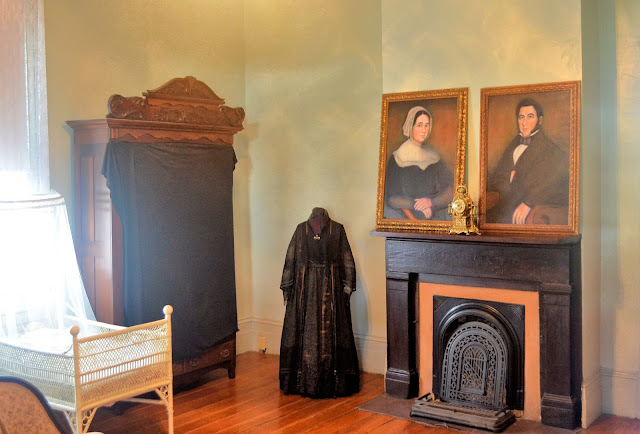 Though re-marriage was allowed for widows after a year and six weeks, many widows not only did not remarry, they might choose to dress in mourning for the rest of their lives. Today we would feel the need to tell a widow to move on, to not dwell on their loss, but is that really the best choice? For many women, then and even now, it may not be. But it would have been an easier choice to make in the past when it was more socially acceptable to do so. The rear porch and entrance to St. Joseph's Plantation. The Mourning Tour runs from October 1st to November 2nd. And I encourage everyone to take advantage of this peek into customs that have passed from our culture over the last hundred years. The staff at St. Joseph's are friendly and eager to share their home and history with each and every visitor. And whether you come for the Mourning Tour or just a regular tour, you'll be glad you did. The grounds are enchanting and the history fascinating. It is a beautiful day-trip you won't soon forget. While you are at the plantation you can buy a copy of the book Early Creole Mourning Customs in South Louisiana. 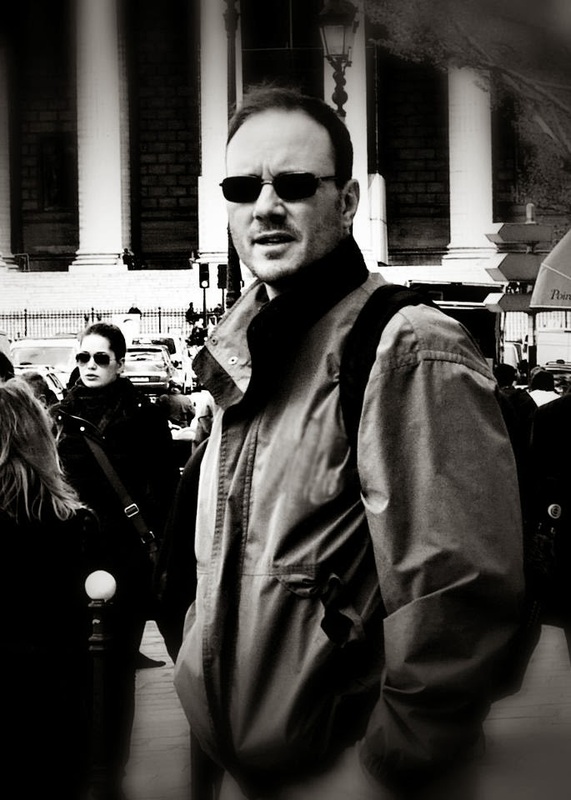 Most of my research for this blog was taken from its pages. Special thanks to Diane Butler and Denise Borell for their generous help and eagerness to share their family's home and history with us. Thank you for that piece. I am from the Jersey shore with a Great interest in Southern customs-often visiting Cape May, NJ, where many Southern families vacationed during this Era. I hope to visit your area some day! You're welcome, Mari. And thanks for the stopping by our Room With No View. Be sure to check out our other posts on Oak Alley, and many other plantations here in Louisiana. I hope you get to visit in person very soon. You'll be glad you did. You are most welcome, Denise. We'll always treasure the tour you gave us, especially the last part of it. It was a day we will never forget! In a recent article, I overheard a conversation in which the old saying is as true as ever regarding something my kids told me just the other day. That should provide all the authenticity necessary to convince you that I know what I am talking about.